So you deployed a chatbot that ticks all the right boxes. Great! Pat your back for me, will you? For the uninitiated, we wrote a blog that outlined the key considerations for choosing an omni-channel chatbot. However, that is not the end of the line in your chatbot journey. Digital shelf life is brutal. Web designs are labeled vintage in no time, web content’s lifespan is equivalent to a bot fly, and even the nifty-est of web tools are susceptible to rust. Chatbots are not isolated from this demanding pace, and a neglected one can start rotting in no time. Chatbots are not everyday tools that you can simply deploy & forget. It is a digital representative of your business, and a visible one as it often is the first point of contact for customers or prospects. Needless to say, it requires continual maintenance and optimization. Unfortunately, inadequate attention has the potential to convert your chatbot into a liability, leading to customer agitation while also tarnishing firms’ goodwill. So, identifying rot and ensuring your chatbot is in the best state is of paramount importance. No matter how formidable chatbots are, they still can be ousted by mere ignorance. Take chatbot maintenance lightly — frequently analyzing and improvising its abilities — and you wager leaving the users out in the cold. Furthermore, your chatbot, the prodigy of technological advancement, ends up dejected on your site, a secluded, abandoned novelty. A pleasant chatbot experience means recurring usage and more data to feed and instruct the bot. However, a great but carelessly maintained chatbot will inexorably pave the way to mediocre or sore experiences and marginal reuse rates. TMI (Too Much Information) or information overload is one of the most common chatbot blunders. Many developers try to make a one-stop chatbot. To achieve this feat, they add a myriad of intents with the aim of answering more questions. The copious amount of information overwhelms the bot and consequently, it fails to identify intents altogether. A more tangible approach would be to identify a handful of L1 intents and train the bot for the same. When the bot becomes adept, add a few more! While this approach can take some time, the resultant chatbot will be fool-proof. Once you have zeroed in on the basic intents, it is time to commence the flat out training! As we mentioned earlier, the ideal way to go about it is by starting with baby steps, i.e. simple intents, and gradually climbing up the ladder. The success of this methodology largely relies on how well the bot is trained. Crowdsourced training is one strategy that leaves no stone unturned and brings down the possibility of failure to almost zero. Once the bot has mastered linear flows, bring in the non-linear flows. Another thing you need to factor in is that the chatbot should be able to pick out an entity from multiple intents. Otherwise, you will have to re-train the bot for the same entity in multiple intents over and over again. Again, quality training ensures a healthy corpus of synonyms and entities which solves the problem. So, your bot is all geared up for action now! But what if it comes across a query which it fails to act upon? Plausible, right? Well, there is a possibility that it might have stumbled upon an orphan intent, one that you didn’t train it for. In that case, the bot will resort to its fallback message or even worse, deliver the wrong answer. Either way, customer experience takes a hit. You cannot let that happen. Every failed interaction needs to be logged so that you can make the necessary alterations and keep tabs on these rogue intents. How capable is your bot? Is it a standalone solution that completely relies on its training for driving conversations? Such bots often tremble at the sight of a query for which they weren’t trained. So, how do you fix it? Well, by integrating the chatbot with your repositories. When training fails, an integrated chatbot scours the connected repositories in order to find a suitable response. This ensures the user is not turned away empty-handed. After everything you did, there will be some queries your bot cannot draft an appropriate response for. And alas, it happens more often than you would like. But what about the users? Goes without saying that leaving them hanging is not an option. This is where the external adaptors weigh in. Instead of simply apologizing for being unable to help, external adaptors help the bot define the next course of action. For instance, a bot leveraged in support wing should be able to create a discussion or ticket based on conversational data, pass on the case to a live agent, etc. Finally, all these steps would be in vain if you fail to periodically measure the impact of interactions. After all, interacting is the sole KRA as well as USP of the chatbot. There are a few metrics it should proactively track and report on its own. At the end of the conversation, it should collect feedback from the user about their overall experience. It is beyond a shadow of a doubt that bot rot is an imminent threat. It targets unsupervised (or neglected) chatbots, thus marring the customer experience and potentially bringing your brand credibility into question. As a business, it is imperative that you take every measure to avoid its onset. 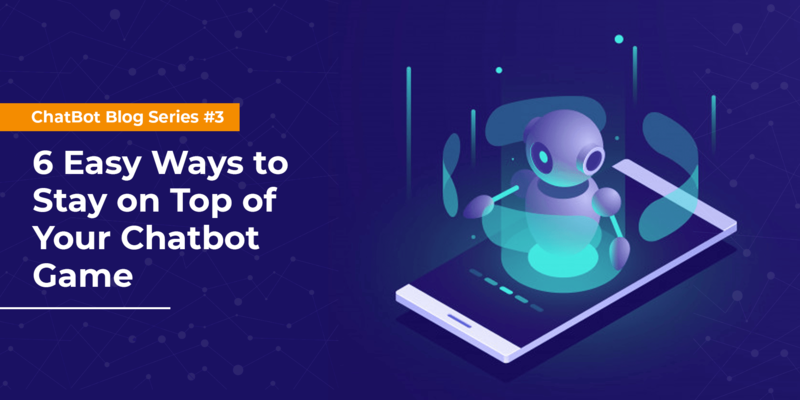 A healthy bot can mean the world of difference between stellar, blazing fast customer service and a horrendous experience that drives customers or prospects away. So, make sure that you keep the chatbot in pristine shape and protect it from digital decay.